A few years ago there was a URC church in Ipswich with a poster outside (in the correct colours) saying: "The Minister follows Colchester United. Who do you follow?" Amazingly it didn't get vandalised! I have a complicated love/hate relationship with the Anglican Church, but if anything could encourage me to give it another go - it would be a report like this. Thank you. I'm surprised no one added an "m" after "who." Odd that it should have described last Sunday as "the fifth Sunday in Ordinary Time". It wasn't. It was the 4th Sunday before Lent, and Ordinary Time didn't start until the previous Sunday, 3rd February. I understand that their new priest starts next month, after a quite short interregnum. Lucky them! 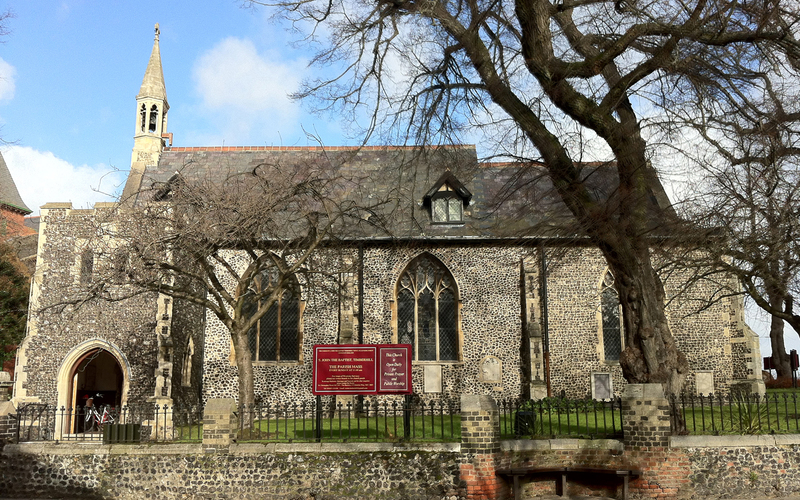 If I lived in Norwich, I might go to Timberhill now and then, but there are a few other rather more inclusive High Church parishes in the city, though Timberhill's encouragement of LGBT+ is a Good Thing IMHO. May some wise person explain the difference between "swell" and "great" in organ playing? Wonderful report. I felt like I was there. And I too would not mind a visit -- though I may take a thermos to avoid the instant! Swell refers to pipes enclosed in a swell chamber -- wooden shutters that can be opened and closed via a foot pedal to increase or decrease the volume of the sound. On a two-manual organ, the swell pipes are usually played via the upper keyboard. Great refers to unenclosed pipes -- the main source of the organ sound. The great organ is played via the lower keyboard. Thank you muchly, Miss Amanda. And thanks for all your work publishing these reports too. Not sure where you got that. Ordinary Time began the day after Epiphany. This past Sunday was indeed the fifth Sunday in Ordinary Time, unless the Church of England calculates it differently from everyone else, including the RCs. @Nick Tamen, yes, I think you are right. It does get a bit confusing when A-C churches try to be more Carflick than the genuine article! As a bit of an aside, I wonder how many A-C parishes these days begin their Sunday Mass with the Asperges? O, and the excellent choreography can be found in other, slightly less spiky, places, such as All Saints, Margaret Street, London, where the servers must surely be drilled by an old-school Sergeant-Major! BTW, the MWer didn't mention (and perhaps didn't know, though it's clear from the linked website) that St John's is also responsible for the church and shrine of Julian of Norwich, the much-revered mediaeval mystic and author. Mass is said at St Julian's church (rebuilt after extensive damage in WW2) at least twice a week, as well as on Sundays. At the risk of stirring up the pong of decaying horseflesh, I wonder if this has something to do with St John's inclusivity - apart from them not (apparently) affirming the validity of OoW? Fascinating. Thank you, Bishops Finger. I took to our almighty spy-master G**gl* and found some further information and photos. Very interesting. Particularly that round tower -- does that sort of feature have a name? Sorry...I forgot to say. There is a dead horse issue at the end of the linked page. Which rather ruins, in my view, the previous material. Well, the author is a Roman Catholic, and (from similar remarks on pages relating to other churches) not particularly well-disposed towards the C of E. He does have good things to say about some of the clergy, however, especially those who keep their churches open every day. AFAIK, round towers are simply called 'round towers'. There are quite a few in Norfolk and Suffolk. Just to add that there is a theory that round towers were constructed where foundations might be a bit dodgy, owing to the nature of the ground, or where large lumps of stone (for the bits at the corners of a square tower) were hard to come by. It's a shame, in a way, that they weren't able to restore St Julian's tower to more-or-less its previous height, but I'm sure they had better things on which to spend their £££. The fact that the church was rebuilt, and is in continuous use for worship, mission, and witness is good enough! Simon Knott's wonderful websites describing the churches of Norfolk, Suffolk, and (a work in progress) other eastern parts of Ukland, are quite absorbing, if you have some hours to spare! He updates previously-visited churches from time to time.